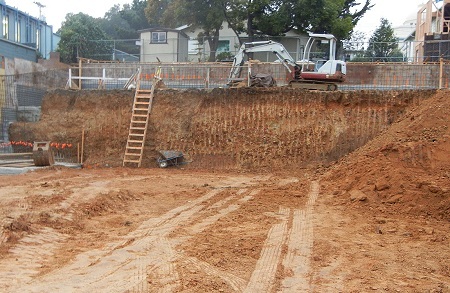 Construction is going on at the lot formerly occupied by a well-behaved motorcycle club, at 4225 Piedmont Avenue by the Kona Club. What caught my eye is that it offered a clean cut into the stuff that constitutes lobe 2 of the Fan. I’ve referred to the Fan often over the years, but I haven’t formally introduced it. 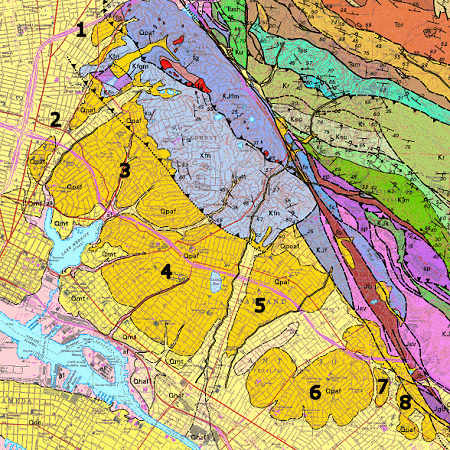 Here it is on the Oakland geologic map. It’s a former alluvial fan that was last active during the Pleistocene, which has been dissected by several younger streams. There’s nothing else quite like it in the East Bay, and I think of it as the Fan with a capital F. I divide it into eight separate lobes. Lobe 2 has two separate parts, Pill Hill and Montgomery/Thermal hill. Anyway, I keep an eye on it because it’s rarely exposed. Only excavations and a few stream banks display it. There’s indistinct bedding that slopes down to the left. The material is gravely clayey sand that’s quite firm and well behaved. 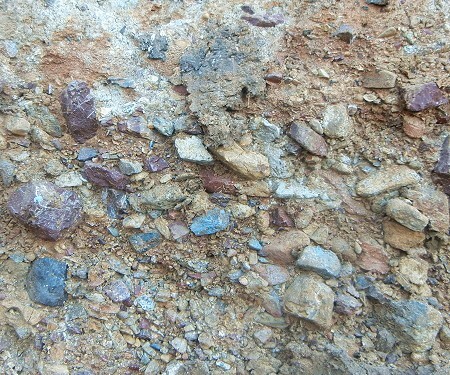 Here’s a closeup of a gravely layer; the stones are large pebble size (about 50-60 millimeters) and represent the Franciscan rocks just uphill in the Piedmont block. Farther over, the wall of the excavation has been carved with a backhoe, and the clayey matrix is so strong that most of the stones have been cut in two, even the tough black argillite. This is alluviumsediment carried and laid down by streams. The rock clasts are rounded, showing that they’ve been carried in a stream for some distance, although most of the rocks are sandstone that doesn’t endure long. 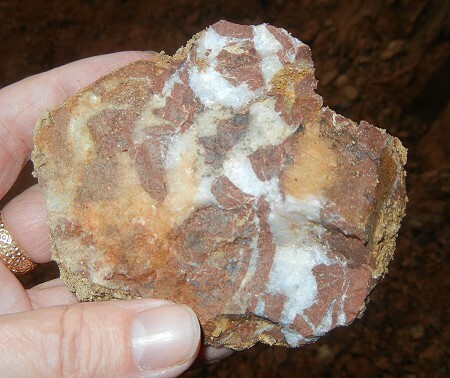 The hardest chert pebbles are still pretty rugged. 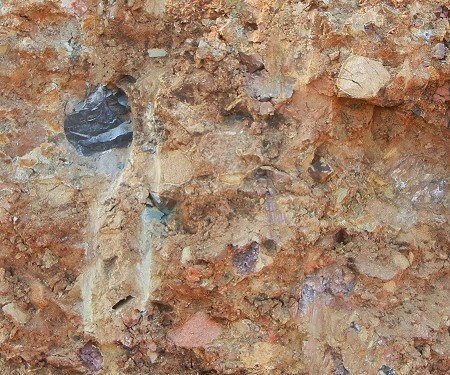 Down on the ground was this very typical Franciscan chert boulder, shattered by the builders after enduring for more than a hundred million years. The lot will become a nice set of dwellings. The builders are blogging about the job, complete with cool drone shots. This entry was posted on 19 February 2015 at 9:59 pm and is filed under Oakland's soil, the Fan. You can follow any responses to this entry through the RSS 2.0 feed. You can skip to the end and leave a response. Pinging is currently not allowed. Wow – even your gravel is colorful. Everything looks like shade of gray here in the northeast. Maybe three blocks away from the dig pictured here, there’s another digging site (on Broadway, just off 51st, under what used to be Poppy Fabric). I haven’t gotten a close look yet, but thought you might like to know. Just stumbled upon your post, fascinating stuff! Was wondering if you have any recommendations for good, local Geology books for Oakland or the East Bay in general. I live on lobe 5 of the Fan you mention above and have wondered about its origin. Now I have a better idea!